My littlest lady, Sadie, has had a lot of therapy in her (just about) three years. While my husband Jon and I spent most of our time focusing our stress on her lack of interest in food and subsequent NON weight gain, running back and forth between doctors and fending off each other’s fears that something serious could be wrong with her –William’s Syndrome anyone? -Sadie was busy falling behind on the developmental end. It wasn’t until she was six-months old that we learned she needed a lot more help than just getting sustenance, she would need help learning to sit, crawl, even hold her head up for long stretches of time. She also needed work on fine motor skills, such as holding things in her hand and eventually learning to use a straw cup at a year because she just never worked out the bottle aversion. When at 12 months old and only thirteen pounds she still hadn’t figured out that food is imperative to growth, we had to go kicking and screaming to a feeding tube. At eighteen months when she still wasn’t talking we found out we needed speech therapy twice a week on top of the PT twice a week, OT twice a week, child development, and a nutritionist all of whom had become part of our inner circle. My daughter had a bigger staff than Oprah friggin Winfrey. But guess what. It paid off. We are lucky is what we are. A couple of weeks ago, Jon and I took Sadie to a little something called an IEP (Individual Education Plan) meeting. This is where many specialists and a psychologist gather to assess your child and determine what special help or intervention might still be needed once your child is of school age and the Early Intervention program doesn’t cover them anymore. Although most of Sadie’s therapists agreed that she’d come an awful long way and had mostly determined that her therapies should be on a check-in basis once she started school, I still felt a sense of trepidation going in. You see, Sadie is still a few months behind her sister Matilda. People always say that kids develop at their own pace and they are all different and you shouldn’t compare and I know this. The twins are not Elby (who will be six in three days!) and they are not each other. Duh. But still, after having the struggles with Sadie, it’s hard not to have her development under a microscope -impossible really since we were updated on how she was doing in almost every area on a semi-weekly basis. So although I’m so proud of the progress that Sadie’s made and I remain confident that she will keep moving forward at the steady rate she has been, I still worried that I’d hear something I didn’t want to hear; some discovery would be made of a shortcoming that failed to make my radar, a problem I thought was solved but was in fact, needing attention. The unknown factor. Like a lot of people I find the unknown intimidating. I would like to always be able to see around every corner so I can be prepared. Is there an iPhone app for this? I’m not fond of surprises. When I was first dating my husband, I was terrified that he would lose interest in me but not tell me. I worried he would just go along because he didn’t want to hurt my feelings but then break-up with me seemingly out of the blue. I worried I wouldn’t see it coming. I’m so scared of not seeing it coming. When I was in the hospital being monitored 24/7 to make sure that Sadie was alive and staying that way, I just wanted to know what to expect. What did a two pound baby look like? How could a baby be that small? So I toured the NICU to see the babies so that I could prepare myself, and I sobbed when I saw how impossibly tiny a one thousand gram infant actually is. How frail. But it didn’t prepare me, how could it? I had to live through it, hold her, worry about her, save her and fail her. Over and over again. I just had to do it. I didn’t know how. Early on, not one of the dozens of doctors we saw could figure out why Sadie wasn’t growing and wasn’t thriving. And although specialists gave us hope and tried to help, not one could tell us how the story ends. Every fiber of my being wanted a doctor to tell us what would happen so that I didn’t have to find out the hard way. When I took Sadie for a feeding tube, I knew that wasn’t the “answer” just another decision in Sadie’s care that could ultimately help or hurt but it just seemed to be the only option left and we were exhausted. And it wasn’t the answer, but it did help. Two years after spending four days at Cedar’s Sinai for the g-tube surgery, and eight months after Jon and I decided to pull the tube, Sadie went for that IEP meeting. My little Sadie sat right down at the table and started playing with colored blocks like it was her job. She sorted them, told the therapists what colors they were, talked about the “boys and girls” at school, gave them her name and age (no last name though -she’s a future diva like Cher) and regaled them with the sweetest renditions of Twinkle Twinkle, Wheels on the Bus and Mary Had a Little Lamb and Hey Hey You You I Don’t Like Your Girlfriend. She had a little trouble with a human body puzzle and started to get frustrated. I had to force myself not to intervene and help her place the hand piece beneath the sleeve piece but eventually she worked it out and finished. I worried that they would find her frustration suspect and I tried to defend her. “She can really do tasks like this, she just needs a minute to work it out,” I said. No one in the room could stop grinning including Sadie who knew she killed it. Unofficially, Sadie is perfect. My daughter is unofficially no longer delayed. She’s not Matilda and she’s not Elby. But she’s officially absolutely where she’s supposed to be. And I still don’t know exactly how the story ends but I can’t let that hold me back. God, I love her so much. Can you blame me? Update: As of this morning, it’s official. I cant imagine how tough this journey has been for you, so nice to hear she doesn’t “need stuff” like she did before. She certainly looks perfect, is that marker on her face? Stefanie, you made me cry. I have been following your story with Sadie since the beginning and have been on the edge of my seat, hoping and praying for you guys and wondering how you were getting through it all. I am so joyful and relieved that she is doing well and I am so proud of you for, well, for being such a good mom. I know that’s what we’re supposed to do, but it sounded extremely challenging and stressful and you stood up to the plate. I am so, so, so happy. Wow, the tears. Thanks a lot for making me cry at work. Oh, and BTW, this was really well written, which is probably why I’m crying. She is beautiful like the other two amazingly beautiful daughters you have. I hear you about all the specialists. We started ‘First Steps’ when Joey was only 13 months old and he was in it until he turned 3 and then he started preschool with an IEP. Scary stuff but everyone tells me that Joey will be just fine. He’s just on his OWN time line. I can’t blame you one bit. That child is utterly lovable. As are your other two of course. What wonderful news!!! All your hardwork, dedication and love has clearly paid off. Good for you for recognizing a problem early on and doing everything you could to give Sadie the best resources and opportunities she could possibly have. I can’t believe how far she’s come from the days of her g-tube. Sadie is clearly a resiliant (from even before birth), determined, precocious little girl who is a very smart cutie pie. Way to go, Sadie!!! PERFECT. Your Sweet Sadie, and this post-script post to three years of challenge…and cherish. I’ve been following your blog. And you helped me to make the decisions to have feeding tubes put in our IUGR preemie twins and even had other tube experienced parents contact me to help make our decision. It feels as though my family trails in the footsteps of your experiences with prematurity and feeding tubes. This post made my day. We’ll never stop worrying, never stop trying to stay ahead of the what if’s and be prepared for anything. But it’s so nice to know that You are THERE. Sadie is finally THERE. Congratulations, you both earned it. I’m following along with your story and it seems to keep getting better. I know the gut wrenching fear and I know that there are still tough moments ahead but, yes, it will get better, you have to just believe. What fantastic news!! Thank you for the update. And be sure to take some credit, mama, you have seen her through some rough times. Congratulations to all of you for your hard work, persistance and reaching this milestone. Go Sadie! Oh, what a relief! I went through a similar situation with my daugther. 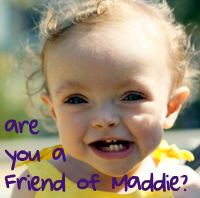 She had low tone, and for the first 18 months, we didn’t know if she would need a shunt to drain excess fluid from her head or had cerebral palsy. Totally stressed me out. With a lot of OT and PT, she did it. Her therapist said she would have a hard time using scissors for the rest of her life and wouldn’t have the stamina to write for very long. Ironically, those are her 2 favorite things to do. So glad that she is doing well now. It’s amazing what Early Intervention can do. Congratulations on all your hard work!! She is TOO stinkin’ cute. thank you so much for sharing your story (all of it, you, your kidz, etc, etc,). thank you. Anne Marie´s last blog post ..Turkey Trot Family Fun Tuesday! You have a great outlook. SUPER AWESOME news! I too have followed Sadie’s progress for quite a while. Congratulations on a job well done mama, for making the difficult decisions, for raising a gorgeous little girl. You deserve all the sweet karma coming your way! Heather´s last blog post ..Hall-O-Weeeeee! NO! That is wonderful and she is adorable!! We never ever stop worrying about our kids and then we have grandkids to add to that too! It’s all good and I wouldn’t want it any other way. Great news Stef! I came across your blog yesterday through Mommy Tracked, and had no idea you had a preemie. I have a 13 month old who was born at 760 grams, 1 lb 9 oz and was diagnosed with IUGR. She is doing great but I can relate to your post. I am constantly afraid to go to the pediatrician thinking he is going to find something; basically the other shoe is going to drop you know? Ater 82 days in the NICU it is hard to shake that feeling. You see and hear so much; it is hard to forget. How awesome for you and for your family to know that officially she is where she should be. I think that is what people don’t get…yes, they are preemies and you want them to be well. But at the same time you just want them to have a normal life. Congrats! Those of us who remember those early moments for you are so happy and relieved you all are finally at this point. She is gorgeous and adorable (but you knew that). Mostly I am so relieved for YOU. Awesome!!! From one mama of twins to another … she is absolutely perfect. And adorable too. Your post made me smile and give my own Sadie an extra hug today. Congratulations! that is just so awesome!! I’m so glad to hear how wonderful she is doing. Great news! Happy birthday to all of your beautiful girls. oh Stef, reading that was so emotional..I can’t know what you and Jon have gone through the past few years, but I can empathize with the “not knowing” and how hard that is…how much I hate not knowing the end. Amazing strides Sadie has taken! Kuddos to you too! We love the way this blog post is so intimate and personal -Touched our hearts -Congrats! Your life and sweet Sadie have mirrored my life and Bryce’s life in so many ways. So glad to hear about all the normal in y’alls life. It a good feeling but takes getting used to.